As you read this (assuming you’re reading it the day it posted), I am on my way to the BlogHer Food Conference in Miami!! I cannot wait! It’ll be so fun to see friends, meet new ones and spend time with my roomie Julianne. We met back in February and she is the best! Plus, I’m stoked to be back in South Florida for a few days. I’ve decided it’s my heaven. I love it. The only bummer is that the hubs couldn’t come with me – he has to work. I can’t wait to tell you all about the trip when I’m back. If you’re interested, follow me on instagram – I’ll be sharing photos all weekend! 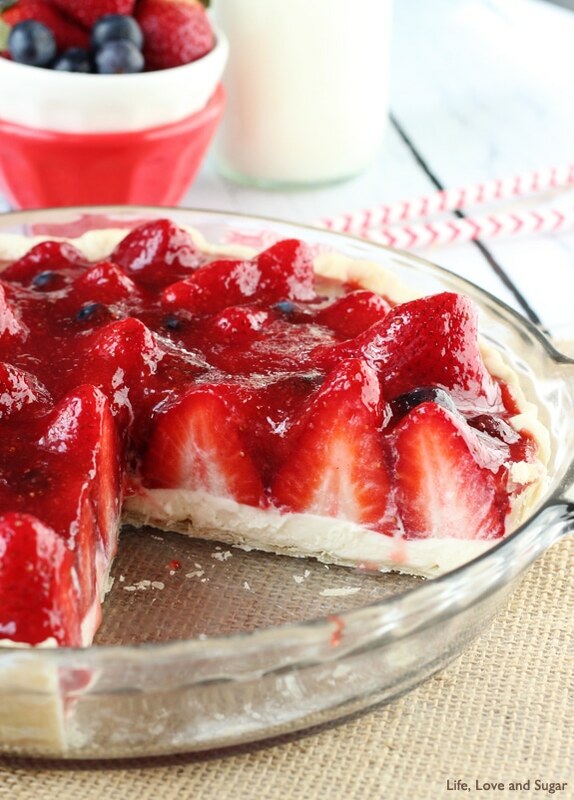 But in the meantime, you must make this cheesecake. Every time I take another bite, I can’t stop eating it all over again. 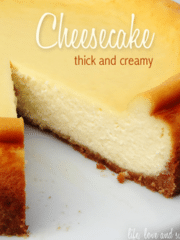 It’s not as thick as some of the other no bake cheesecakes I’ve shared – I think because of the Nesquick mix – so you’ll want to make sure to keep it in the fridge right until you serve it. And as much as I dig a thick cheesecake, it doesn’t bother me one bit that this one isn’t as thick. And the chocolate Oreo crust is the perfect compliment for it. I considered nilla wafers, graham crackers and even golden Oreos, but the chocolate contrasts and compliments the strawberry just like it should. The hubs has gone totally crazy over this cheesecake. I was told I couldn’t give any away. That’s always a good sign. And honestly, I kind of didn’t want to. Except that I’m trying to eat better and eating an entire cheesecake doesn’t really go with that goal real well. Bummer. But as much as I hate cutting back on my sweets, fitting into old clothes has been really nice. Even so, I had more of this cheesecake than I thought I would. I just couldn’t resist. And because it’s no bake, it is so easy to make. The crust is just Oreo crumbs, melted butter and sprinkles mixed together, then pressed into the bottom of a springform pan. The filling is mostly cream cheese. Added to it is some sugar, vanilla, strawberry Nesquick powder mix and a little milk to break up the powder and smooth it out. The Cool Whip that gets added loosens up the cream cheese. You can replace it with homemade whipped cream if you’d like. 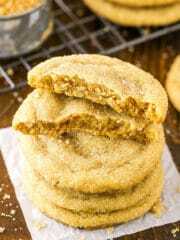 The recipe I have on the blog would work great, but you might want to add a little more powdered sugar to it, so it’s thicker. Probably about 1/2 a cup for 1 cup of heavy cream. And that’s it! Just let it set in the fridge – I usually leave it overnight. When it’s done, you can add more whipped cream and sprinkles. 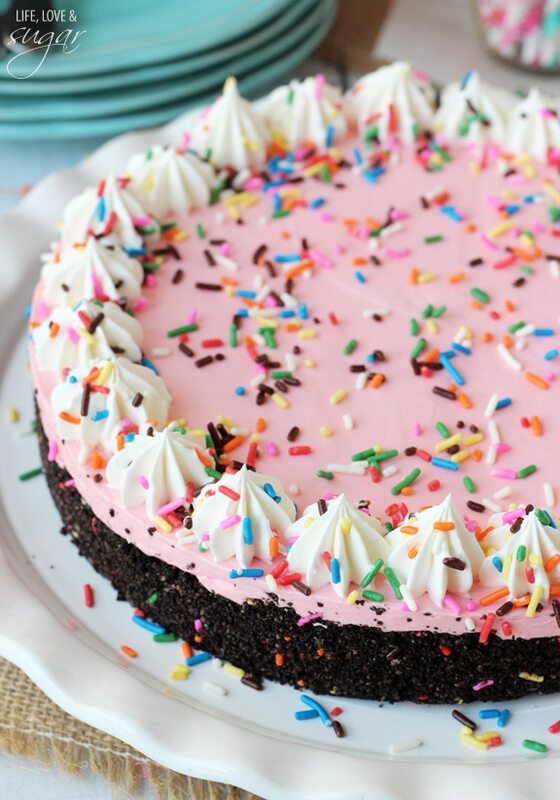 Don’t the sprinkles just make it so pretty? 1. Combine Oreo crumbs, melted butter and sprinkles. 3. Mix cream cheese, sugar, vanilla, strawberry Nesquik mix and milk together in a large bowl until smooth and well combined. 4. Gently stir in Cool Whip (or homemade whipped cream). 5. Pour filling into crust and smooth the top. 6. Refrigerate for about 5 hours or until firm. 7. 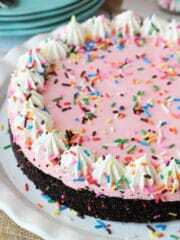 Once firm, remove cheesecake from springform pan and decorate with additional Cool Whip and sprinkles. 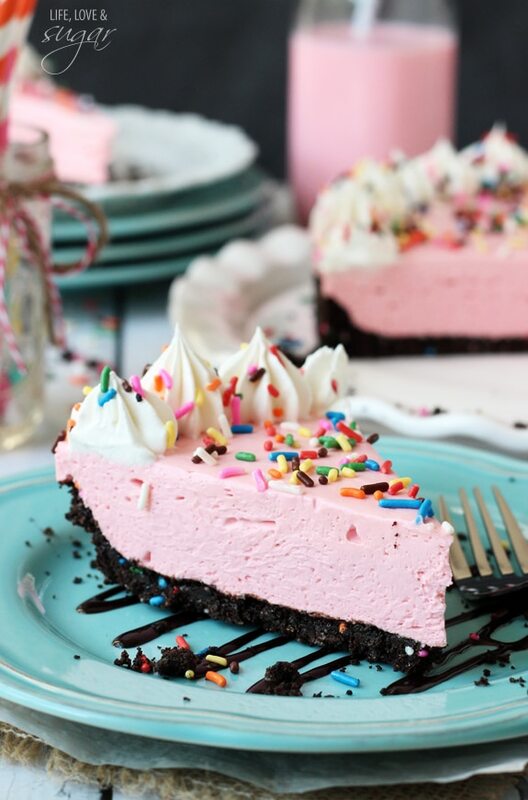 That pink color makes this cheesecake look so cute! 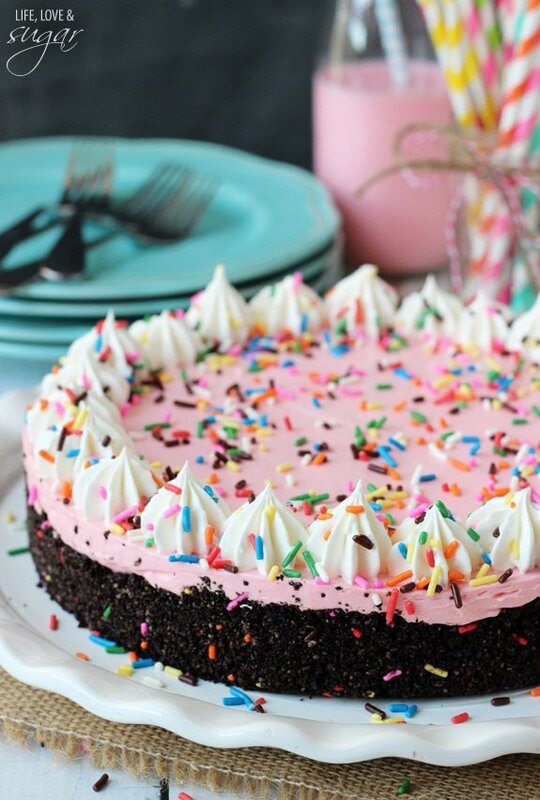 The pink, the Oreos, the sprinkles… this is my kind of recipe Lindsay! 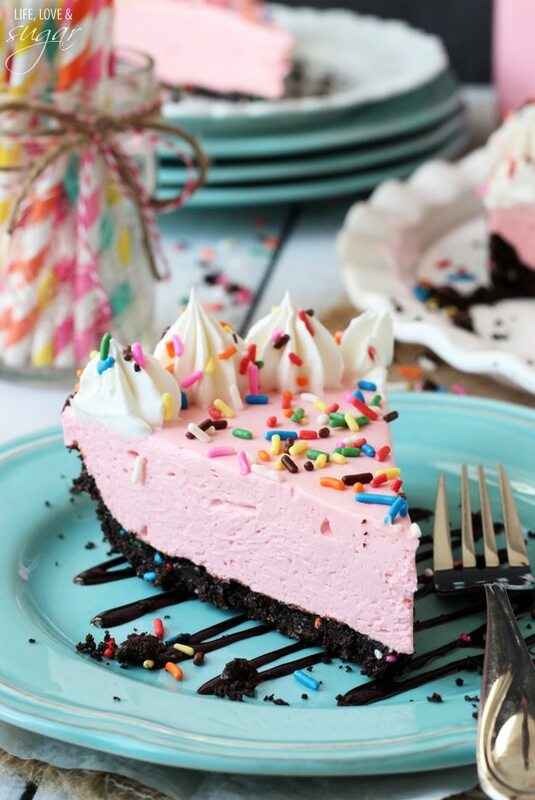 Perfect birthday cake for a cheesecake lover! Stunning, fun photos!!! 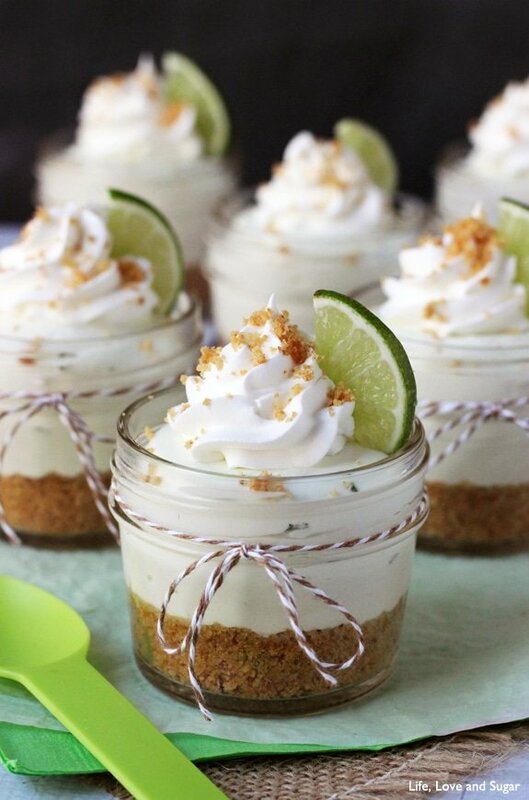 I seriously die every time you post a new recipe! Girl you got mad skills in the kitchen and with your camera!!! Can I come live with you? I will gladly do dishes as long as I can eat every single thing you make 🙂 This no bake pie is incredible. 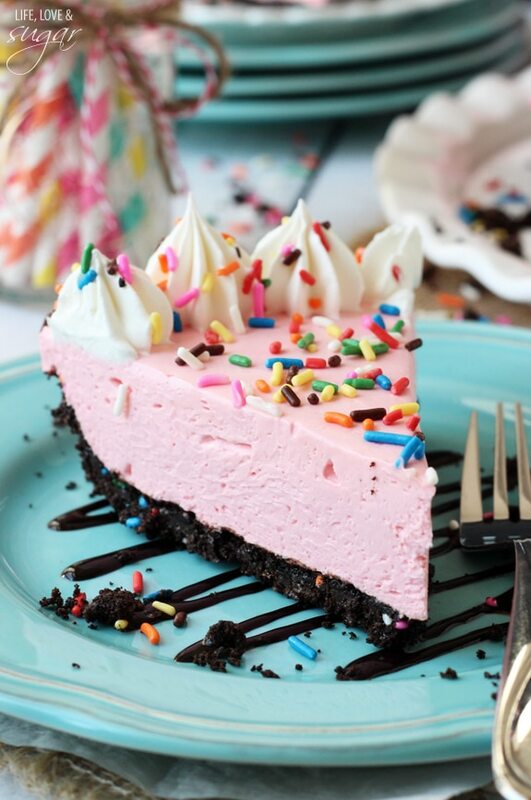 Totally loving on the sprinkles in the crust and the chocolate and strawberry contrast!!! Aww, thank you so much Jocelyn!! 🙂 You could totally live with me – or at least in the neighborhood. How fun would that be?! Can’t wait to see you in person this weekend! I’m so done with you and all these amazing and fantastic recipes!! This is seriously so gorgeous! Oh no! Don’t go! 🙂 Thanks Jocelyn! Have fun at BlogHer!! I’m a wee bit jealous but at least I have this amazing strawberry cheesecake to keep me company. 😉 Because it WILL keep me company. In my belly. Ok I’m done being weird – gorgeous cheesecake Lindsay! I don’t have a spring form pan. Could I do this in another pan? I know it won’t be a cute, I just want to make sure it will fit. Maybe a 9×9 or regular pie pan? Please email!!! I want to eat this ASAP! Mmmmm…. Yes, another pan would be fine. 9×9 could be a little big. 8×8 might be better. Either way should be fine, the 9×9 might just be a thinner cheesecake. If you have a round pan that isn’t springform, you could use that too. Have fun at BlogHer! I’ve never baked with strawberry Nesquick before but this cake is making me want to run out right now and get some! And, yes, it is after midnight. Sleeping is for people who aren’t on a mission to make a no-bake cheesecake this instant!! Yum! what a beautiful cheesecake, I could eat it with my eyes. Such a refreshing change from the usual! I’ve got to make this. Have a great time at BlogHer; I’m jealous! Thanks Katie! It’s my first BlogHer conference, so I’m excited! This is seriously testing my willpower! I’m trying to eat healthier (and in moderation) too, so this could be a dangerous experiment…perhaps I’ll save it for a special occasion – like a Saturday or something! Your photos are stunning! I love all the colors. And you put sprinkles in your CRUST. Dying. 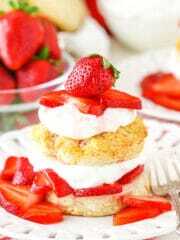 I’m wondering how much fresh whipping cream would you use ? I’d use about 1 1/4 cups. 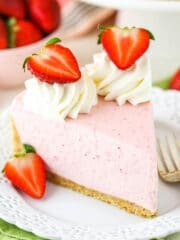 I was wondering if you could make this with strawberry milk instead? And would the recipe change in any way? 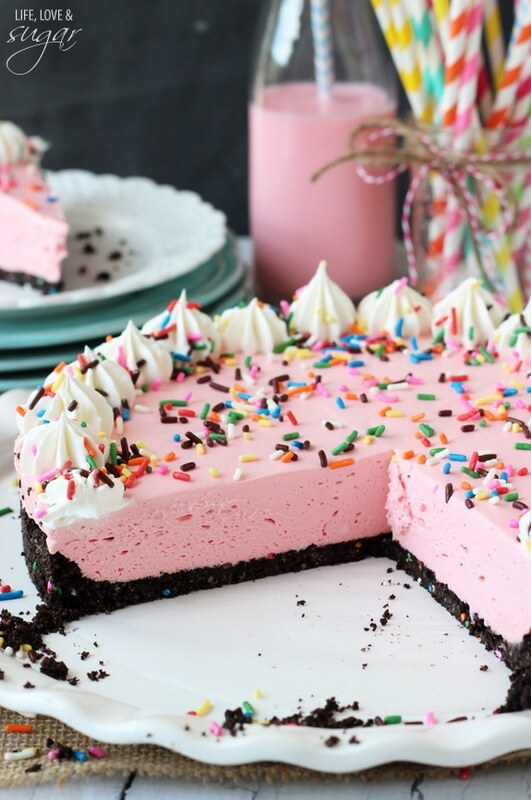 There`s someone I want to make this for and he really likes a certain brand of strawberry milk, and I want to use it to make him something he`d like, and this seems perfect. I don’t think strawberry milk would work well. The cheesecake wouldn’t be thick enough. The powder works because it’s not a liquid. Could you miss out the mikk if using ready made strawberry milk shake drink? There’s only 1 tbsp of milk, so strawberry or regular won’t make a big difference. But yes, you could use strawberry milk in place of regular milk. This looks amazing! 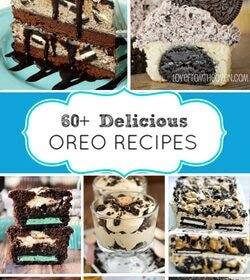 I’m totally making it next weekend 🙂 About how many oreos will it take to get 2 cups? I made this recipe yesterday. It’s absolutely delicious! Everybody at home loved it! Thanks, Lindsay! Congratulations on this great website! i love the fun colors and it looks yummy too! 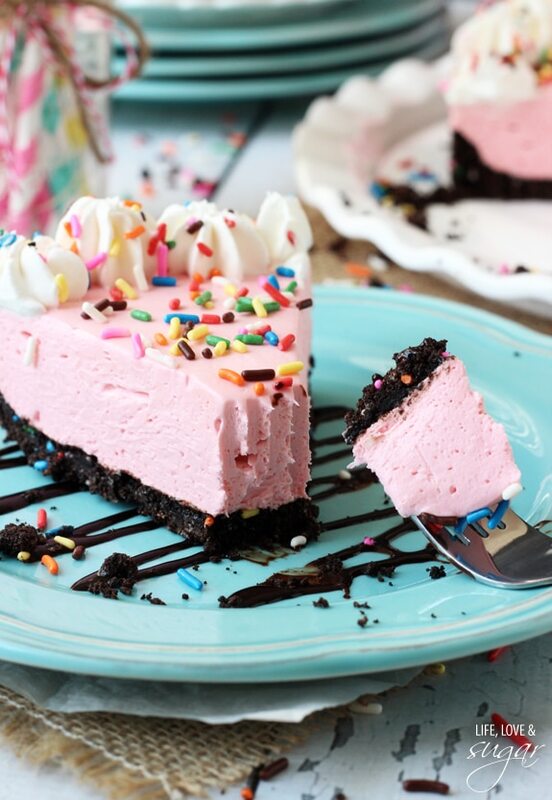 This cheesecake looks fabulous! I love that the recipe is so simple <3 ! Pinned! Oh I love this so much! Would love to make it for my niece’s next birthday! Thanks for posting! 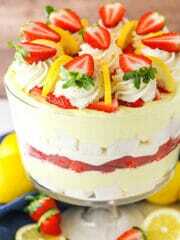 That is so pretty and bet it’s yummy also, thanks! I’m so glad! Thanks Mia! This looks amazing!!! What frosting tip did you use on the whip creme drops? Thank you..I just found you blog today. 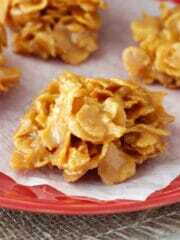 I am cooking for a lot of football boys this season and printed all your rice crispy bar recipes!! I live in Canada and unfortunately we only have the strawberry nesquik in syrup form, could that be used or maybe some strawberry jello powder or something?? 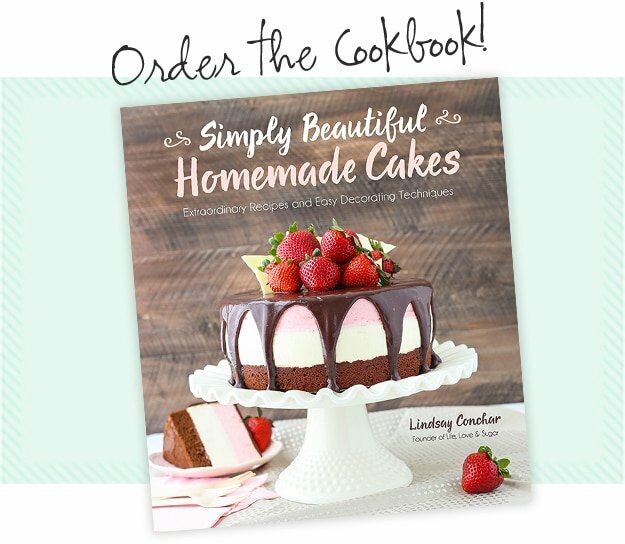 All youre recipes that I have made have been a huge hit, love them!!! Thanks Danielle! You could try the syrup, but be careful not to add too much or it’ll affect the thickness of the cheesecake. Jello powder might be ok, but a different kind of flavor. I made this and i loved it – i added more nesquik though 🙂 i was hoping you could tell me what camera you used for the photos? They look so neat! I’m so glad you enjoyed it! I use a Canon Rebel T3i camera. Thanks Georgina! I love the recipes on your blog! I’m from india and we don’t get nesquick powder here. So is it possible to use hershey’s strawberry syrup? if so, how much quantity of syrup can be added? I’m so glad you enjoy the blog! I haven’t tried it with the syrup. 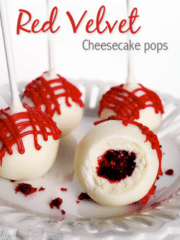 I imagine it would thin out the cheesecake a bit, but I’m sure it’d taste good. I’d try 1/4 cup of the syrup and then see if it adds enough flavor. If not, increase from there. If it gets too thin, you could use gelatin to thicken it a bit. I hope that helps! I am so bummed I don’t have a springform pan. Do you think I could make this in a pie dish? Thanks! Yes, it should be fine in a pie pan. Just make sure to use one that’s a little deeper so that all the filling will fit. Hey I just made this gorgeous cheesecake, followed the recipe word by word, it’s spent 14 hours in the fridge and yet it still isn’t solid, it’s not set quite right. It tastes heavenly though! I woder what I could do to make it set right? Should I put it in the freezer? Thanks in advance! Hmm, it’s hard to say from afar. It won’t be as firm as a baked cheesecake, but should be firm enough. You could freeze it and eat it that way. I have made this a few times…I always freeze it…then it is out for a couple ours til served I also don’t do the cool whip topping and sprinkles til I’m ready to serve. I’m thinking that if you put dried strawberries in a food processor and grind them to a powder, that would work nicely. I love your blog. 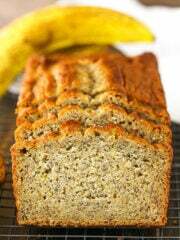 All the recipes are so simple and the end products are so delicious. I am from India and we don’t get Nesquick powder here. Can you tell me some other alternative? I’m so glad you’ve enjoyed the recipes! 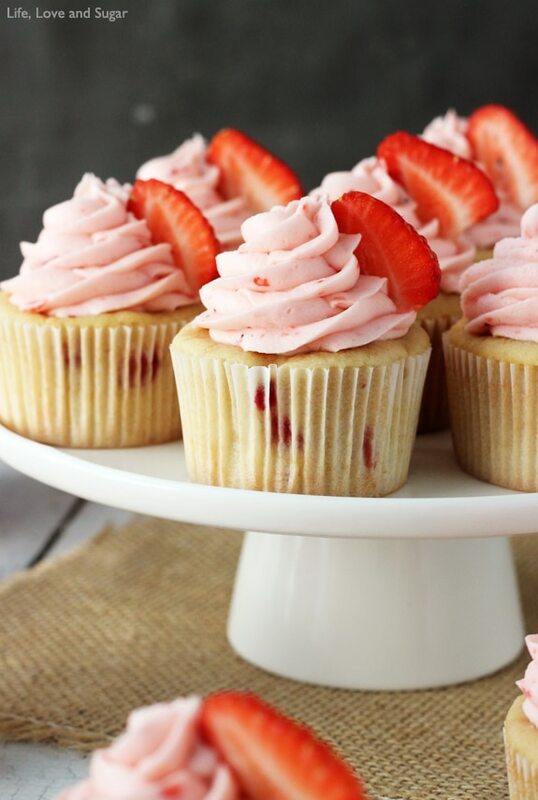 One option would be to get some dried strawberries, pop them in a food processor and grind them down to a powder. I’d suggest a strawberry sauce, but I think the end result wouldn’t be thick enough. Powder is going to work best. Can’t wait to try this recipe, but I was wondering if the 1/2 cup sugar that is added is granulated or powder? Thanks! Just got from the cookout for which I made this recipe. I found out when I got there that I was the only person to bring dessert and boy was everyone upset they only got small portions! Even with the small portions, this was the hit of the party, it was phenomenal! My friends asked me to express their appreciation to you for conceiving of this amazing dessert, THANK YOU!!! Awesome, I’m so glad everyone enjoyed it and that you saved the day with dessert! 🙂 We always need dessert. 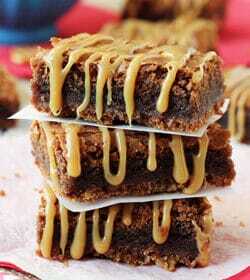 The sugar that is used in this recipe, is it granulated or confectioners? what would happen if I used one 8 oz. of strawberry cream cheese and left the other two as regular? Would you be leaving out the powdered strawberry mix? I’m sure the strawberry cream cheese would be fine, but if you leave out the powder you would probably not have much strawberry flavor. Approximately how many people would this be able to serve? 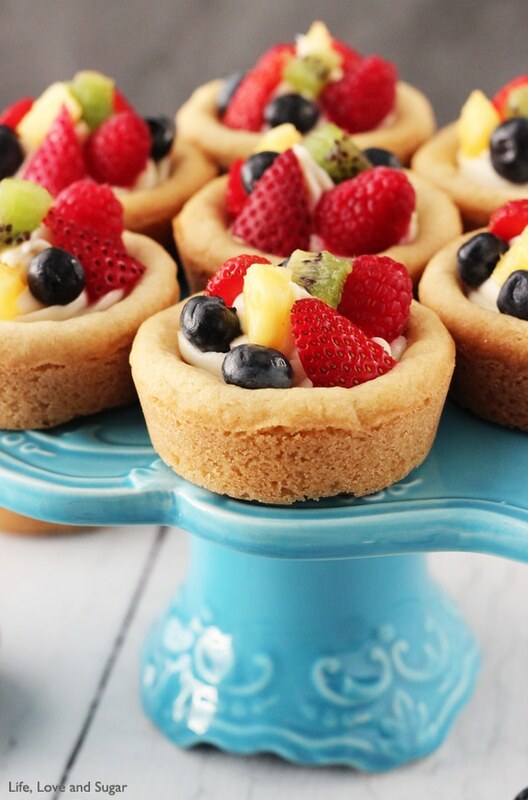 I am a teacher and my students are interested in making a dessert dish. I wanted to make this dish. I have four groups of 5-6 students and each group would be responsible for making their own cake. Thanks! It should make at least 10-12 pieces, depending on size. Hi Lindsay, I just stumbled upon your blog, as I was searhing for a Nesquik Cheesecake.. so it is perfect! My on thing is have you ever made it without the cream inside the cake? Do you think it would ruin it? I’m not sure what you are referring to by cream? I tried this recipe and my batter is runny than usual. I am worried that it wouldnt come out as desired. Its for a friend’s birthday ???? Hello, just love your website. today I tried to sign up for your newsletter and it wouldn’t let me is there a problem with signing up. Thanks so much Melissa! It should be working, but try this link if it isn’t. Otherwise just let me know which list you want to be on and I can add you. 🙂 Thanks! Hi can this be made in cupcake moulds rather then a whole cake? Hi, can’t wait to make this for my daughter! We’re in the UK & don’t really measure in cups so I was wondering if you could convert the cup ingredients to grams or ounces for me please? Thank you in advance! I actually have a conversion chart here. I hope that helps! 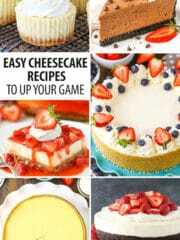 Hi, I had to thank you for such an easy & fun cheesecake recipe. I made this for an Elk’s Super Bowl Party on Feb. 3rd & it sure was a hit !! Wish I could show you a picture.